Wigan Athletic midfielder Alex Gilbey has undergone ankle surgery that could rule him out until the New Year. The 21-year-old had enjoyed a superb start to his career at the DW Stadium after joining from Colchester over the summer, having impressed while playing against Latics in League One last term. However, he’s missed the last three matches since being stretchered from the field during the goalless draw against Fulham on September 17 with an ankle injury. Gilbey, who’s been on crutches for the last two-and-a-half weeks with his leg in a protective cast, underwent exploratory surgery to get to the bottom of the problem. The verdict was that further surgery was the only option, and Gilbey is now fully focused on getting back to full fitness as quickly as possible. “Operation was a success. Can’t wait to start my rehab now and get fit and get back on that pitch!” he tweeted. Boss Gary Caldwell suggested the problem might be fixable without the need for further surgery, and was hoping to have him back within ‘six to eight weeks’. However, the lay-off will inevitably be longer after the medical experts ruled further surgery was the only option. Speaking ahead of the surgery, Caldwell had explained: “The surgeon will be having a look at his ankle under general anaesthetic, and do specific tests on his ankle. “If all goes well, they’ll stitch him back up and they’ll do nothing to the ankle. “If he does need something done, it will be done there and then. “At the moment we don’t think he’ll need the operation. “But we don’t want to waste any more time, we want to see what’s going on. 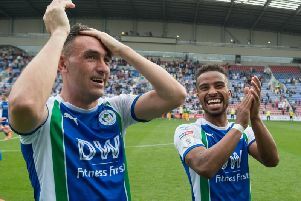 Gilbey had been a virtual ever-present in the Latics side after hitting the ground running during an impressive pre-season. He’d also shown his versatility by slotting in at right-back after a succession of early-season injuries in that position. Gilbey’s absence has been offset by the return from a hamstring injury of midfielder David Perkins, who has also deputised at right-back.